This March 6, 2017, file photo shows air traffic controllers in the control tower at Miami International Airport. The union representing the United States’ air traffic controllers is suing the Trump administration over pay that has been frozen as part of the partial government shutdown. It is a sign of increasing tension between federal workers and the government as the impasse edges closer to becoming the longest ever. 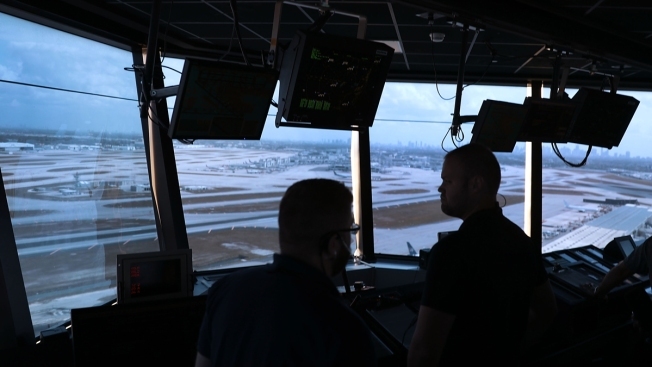 The Federal Aviation Administration’s air traffic controllers are among the 420,000 federal employees who have been deemed essential and ordered to work without pay. The suit, filed Friday in federal court by the National Air Traffic Controllers Association, alleges the government "unlawfully deprived" thousands of its members of pay "without due process." NATCA represents some 19,000 FAA employees, which includes 14,000 air traffic controllers. They have already missed a paycheck, according to union spokesman Doug Church. The shutdown began on Dec. 22 after President Donald Trump and Democrats in Congress could not agree over funding for a wall along the U.S. southern border. The effects of the shutdown are already rippling through aviation, stalling the required federal approvals for new jets and routes, as well as certifications for new mechanics and other workers. Transportation Security Administration officers have been calling out sick in greater numbers than at the same time last year, the agency said. The approximately 51,000 TSA officers on Friday missed their first paycheck since the shutdown began. Some told CNBC they planned to dip into savings to make up for the lost check. Air traffic controllers, flight attendants and other aviation workers also protested the shutdown in Washington on Thursday. Miami International Airport said that amid the shutdown it is relocating flights scheduled to depart from Concourse G after 1 p.m. this Saturday through Monday to terminals F and H. A spokeswoman for United Airlines, which uses Concourse G, said it is telling travelers to arrive at the airport early and check their departure gates for changes. Pittsburgh International Airport said it would provide free meals on Friday to federal airport workers.